An apprenticeship is a combination of working and learning to gain qualifications. Higher apprenticeships (level 4 and above) are designed for applicants who want to achieve a higher education qualification but prefer to get straight into work rather than search for work only after they have completed a university degree. Applicants typically need a pass in two A-levels and five A-C GCSE grades in order to apply for a higher apprenticeship. 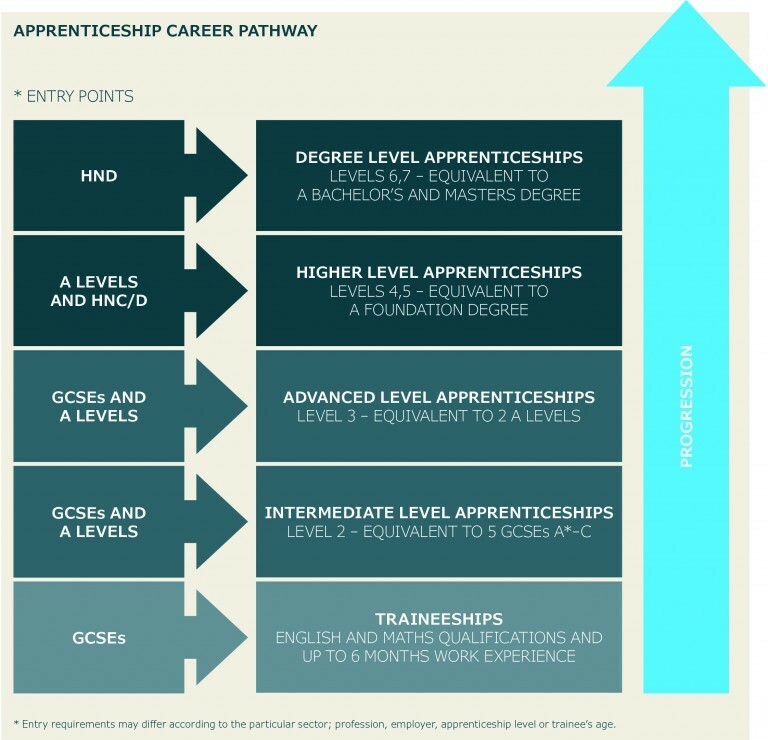 What are the advantages of higher apprenticeships? Study while you work. Higher apprenticeships are designed for young people who have done A Levels and want to go directly into employment while, at the same time, studying for a qualification. Apprentices work a minimum of a 30-hour week and study in their spare time and can achieve a range of qualifications up to the equivalent of a Masters degree (see above). Avoid student debt. One of the biggest appeals of higher apprenticeships is that the employer (or the Government) will foot the bill for the apprentice’s education. The apprentice may have the benefit of a higher level qualification but without the £27,000 price tag. On the other hand, the apprentice may miss out on the student experience itself which is highly valued by many. Get paid. In addition the apprentice is paid for the work that they do, with many of the top recruiters offering starting salaries in the region of £15,000, with some salaries upwards of £20,000, especially in the professional services and the civil service sectors. Job security. Apprenticeships are seen as a reasonably low risk route to a permanent position with the company, providing some level of job security which is sorely lacking in the graduate market, with 31% of graduates considered not to be doing graduate level jobs (Source: Department of Business and Innovation, April 2016). If the applicant chooses to move employer at the end of their apprenticeship, they are also at a possible competitive advantage to other applicants as 79% Employers value experience above all else, according to a survey by the British Chamber of Commerce. ‍Open the door to key industries. The apprentice route may also offer you access to industries that are either very competitive or hard to enter by the traditional university route, like the tech industry. Developments in this sector occur so fast that no degree can keep up with the pace. It is estimated that 1 million digitally skilled workers will be required in the UK by 2020 and currently there is a serious skills shortage, pushing up demand for candidates with experience. Similarly sectors such as finance, law and engineering offer great opportunities for higher apprenticeships. Visit https://www.getingofar.gov.uk/ for information on all the options available to you. Don’t waste your time. Many people find themselves doing any degree because they feel that this is expected of them. If you are not genuinely interested in studying, university may not be your only option. Students often expect that a degree is a pre-requisite or some kind of guarantee of a job. Increasingly it happens that this is not the case. Ultimately only you can decide which route is best for you. There are some strong arguments which favour the apprentice route but many students will say that the socialisation aspects and the academic challenges a high quality academic education offers are irreplaceable. In addition, going down the apprenticeship route rests on the premise that you make your career choice while you are still at sixth form. Most people do not have sufficient self-awareness at this age to make a decision about their future career. If you are struggling to understand what should be your next step after school or which career is right for you, give one of our career consultants us a call on 0207 424 9401 and check out our Career Choice service which is designed specifically with you in mind.